Thayne-san, today we’re going to visit another shop on the east bank of the Sumidagawa River. 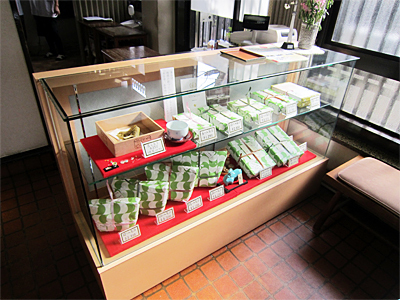 It’s next to an old temple called Chomeiji, and the shop’s name is Chomeiji Sakuramochi. It was founded in 1717, meaning its history spans nearly 300 years, and making it one of the oldest shops even within the Toto Norenkai association. Have you heard of it? Of course! In fact their sakuramochi is one of my favorites. But despite enjoying sakuramochi, so much I’ve never been inside the shop. Hello. Yamamoto-san:Good afternoon Thayne-san and Concierge-san!. Yamamoto-san, it’s great to meet you. I’ve been looking forward to our visit today. Your shop has such a long history. The United States wasn’t even a country when your shop was founded in 1717. Yamamoto-san:Well, please sit down. I’ll bring you some sakuramochi. These have a different shape than the sakuramochi you find at other shops. They’re wrapped tightly in three large leaves. Have you done it this way since you first opened? Yamamoto-san:We have. The first generation owner, Yamamoto Shinroku, was a gatekeeper at Chomeiji and apparently the hardest thing about the job was cleaning up the fallen cherry tree leaves. The embankment along the Sumidagawa River has been a famous spot for cherry blossom viewing since the Edo Period. Of course, cherry trees are deciduous, and in the autumn no matter how much you rake, there are always still fallen leaves on the ground. Taking a breather from raking one day, Shinroku thought maybe there was some way to use the cherry leaves. He wondered if the temple couldn’t pickle the leaves, use them to wrap mochi, and sell that to visitors. 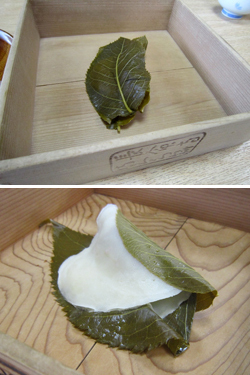 By wrapping the mochi tightly in three pickled sakura leaves, it won’t dry out. It gives off a nice aroma, too. You can tell this would be popular. Yamamoto-san:That’s right. We started selling them in front of the Chomeiji gate, and they became increasingly popular, eventually being called one of the local specialties of the city of Edo. In 1824, about 100 years after our shop first opened, our records say we were making 31 barrels of pickled cherry leaves a year, and about 25,000 leaves fit in one barrel, for a total of 775,000 leaves. That means we sold about 387,500 sakuramochi. Wow! And you’ve been that profitable all along? Yamamoto-san:Not quite. We’ve had good times and bad times. My father went off to fight in the war, and during that time, the shop was destroyed when Tokyo was bombed. It feels like we just barely managed to overcome crises time and again. We’re probably lucky we aren’t located in central Tokyo. How do you make the sakuramochi itself? Yamamoto-san:We mix flour with water and roll it into oval shapes on a grill, and bake them like mini crepes. That becomes the mochi skin, and we fill each one with a lightly sweetened red bean paste of our own recipe. Finally, we wrap it in the sakura leaves. Mochi sure is delicious. It’s the flour that makes it so good. But I’m surprised to hear you still roll the dough for each one by hand before baking, rather than doing everything by machine. Do you pickle the sakura leaves here? Yamamoto-san:No, we have that done in Shizuoka. We use leaves from the Oshimazakura tree, which are large and tender. The pickling process brings out an aromatic substance called coumarin, which gives it that unique smell. After the pickled leaves are delivered to us, we wash each one and inspect them for quality before using them to wrap the mochi. I can see you’re very careful in your work. I wanted to ask, is it rude to eat the leaves together with the mochi? Yamamoto-san:We want you to enjoy the taste of the mochi and red bean paste as well, so it’s best to remove the sakura leaves before eating the sakuramochi. That way you can really appreciate the lovely aroma of the leaves. Mmm, that’s yummy. But now I’m going to eat the sakura leaves too. Yamamoto-san:Go right ahead. I once heard a story told by Ozawa Shoichi which went like this: A man was eating sakuramochi, leaves and all, when the servant next to him noticed this and said, “Master, when eating sakuramochi you should remove the leaves.” (In Japanese, “kawa o muku.”) The man replied, “Is that right,”and turned to face the river (“kawa o muku”) as he continued eating. 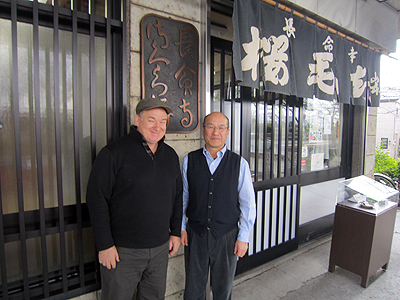 Yamamoto-san:When you’ve been in business for so long, there are a lot of stories to tell. In the Edo Period Shinroku’s granddaughter was shown in a series of ukiyoe woodblock prints called “One Hundred Beautiful Women at Famous Places in Edo.” But the story we’re most proud of was that the haiku poet Masaoka Shiki lodged with us on the second floor above the shop for about three months when he was a student at Daigaku Yobimon (now Tokyo University). Nanakusa, the collection of hand-written poems Shiki penned during that time, includes several plays featuring the daughter of Sakuramochi-ya as the main character and love poems about her. From Edo Period woodblock prints to Meiji poems, your lineage of beautiful women is strong! The stories seem to fit the nearby Hanamachi/Mukojima red light district. By the way, I’m really impressed you didn’t start making other sweets after sakuramochi became such a big hit. Most people would want to expand to also sell other things like botamochi, kori azuki (sweet beans with ice) in the summer. Yamamoto-san:Except for the very short cherry blossom season, our business was almost entirely family run, and I think they just didn’t have the time. We dedicated ourselves single-mindedly to sakuramochi. Were you busy because of the red light district in this area? Yamamoto-san:We were busy with community association activities and other things. Could you give us some parting words of advice on how to stay in business for 300 years? Great! Thanks so much for talking with us today! 隅田川沿いに店がある。 春の桜の時期には桜餅を買い求めるお客で長い行列ができる。 Chomeiji Sakuramochi is located along the Sumidagawa River. During the cherry blossom season in the spring there is often a long line of customers waiting to buy sakuramochi.